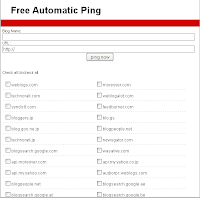 Pinging is the information to send those sites which index feed of blogs. When you make post on your blog these sites index information of that post but this is not automatic, actually you have to inform them about your post. This is done by sending ping to sites. But it will be very tedious to send ping one by one. Now if you find some site which send ping to many sites at once, hows that. These are sites which send ping at once,http://pingblog.co.tv/ . You have to put your blog name and blog url check sites where you want to send ping and click Send Pings or Ping now respectively.